Fireworks, carnivals and dancing girls can only mean one thing – we are in Brazil to witness one of the great party events – the famous carnival. 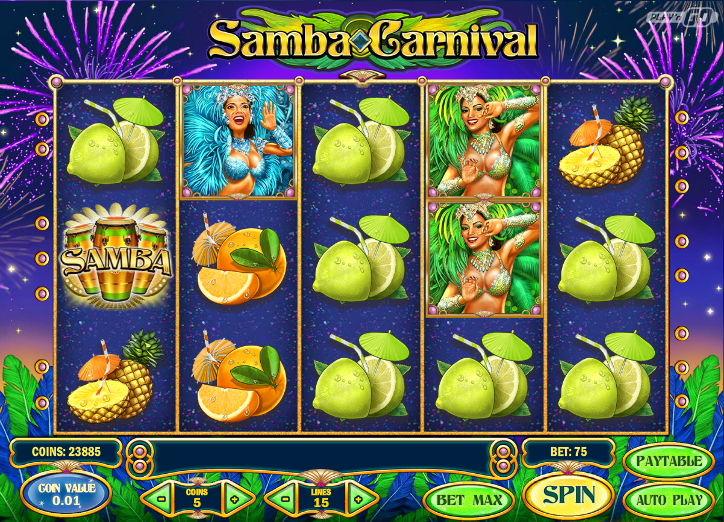 This online slot is called Samba Carnival and it’s a bright & cheerful game developed by Play N Go – you can read all the essential details below. Samba Carnival is a five reel slot with three rows and up to fifteen paylines; the gold-rimmed reels spin against a backdrop of fireworks exploding in the night sky and underneath there a clutch of blue and green feathers of the sort which form the dancer’s costumes. Three extravagantly-attired dancers (pink, blue and green) are the higher value symbols and they are joined by pineapples, watermelons, oranges and lemons. Winning combos can be formed from right to left as well as left to right. The wild symbols are sets of two, three, four or five maracas and if they help out with a winning combo will multiply that amount by the number of shakers. The wild won’t replace the bonus symbol which is a set of samba drums. This is triggered by landing three of the drum scatter symbols anywhere in view; you will now play a picking round and all you have to do is bang on one of the drums to win a multiplier of up to 150x your total bet. If you’d like to gamble your most recent win just click the ‘Gamble’ button below the reels – you now have the chance to double or quadruple that amount by guessing the colour or suit of the next card drawn. There’s a maximum win of 2500 coins but a wrong guess will lose it all. 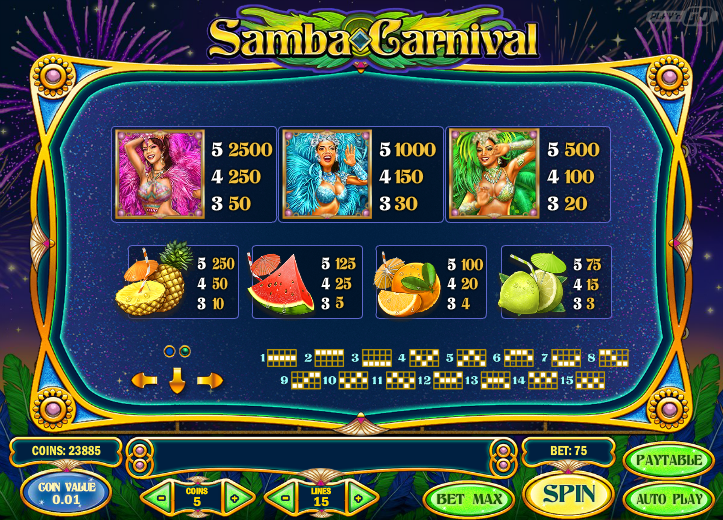 Samba Carnival is a colourful, enjoyable and relatively simple game which ticks along nicely with some entertaining graphics and perky sound effects. It has an RTP of 95.79%.